Writer and director Dustin Feneley’s feature debut is a beautifully lyrical and cinematic tone poem that brings an unflinching eye to loneliness and isolation.After eight years stuck in development limbo before a record-breaking crowdfunding campaign pulled in $125,000 and finally enabled its completion, Stray hits the screen like a double lungful of frosty mountain air. Feneley seems to have an affinity for depicting gelid geographies and social misfits. Born 1982 he graduated from the Victorian College of the Arts Film School at the University of Melbourne, after which he wrote and directed the short film Snow, which screened as an Official Selection at the 2006 Cannes Film Festival. He won the Qantas Spirit of Youth Award for Moving Image the following year and in 2011 received the Filmmaker Grand Prix at the Sapporo International Short Film Festival for his body of work in short films, including Hawker, an atmospheric portrait of a traveling salesman, and the intimate portrayal of a young disabled man’s first romantic encounter, Eskimo Kiss. With Stray, Feneley has constructed a haunting narrative about a young ex-con attempting to overcome the psychological legacy of his violent past and his encounter with another estranged outcast, recently released from a psychiatric facility and far from her own homeland. Both characters exist at an extreme remove from the rest of society, partly as a result of their individual circumstances, partly by choice. 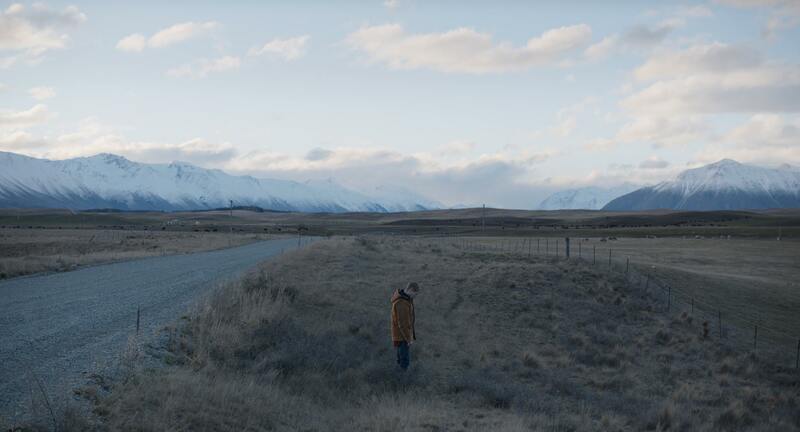 Shot mainly in a few remote Central Otago locations, it is the first New Zealand feature to be selected for the Moscow International Film Festival. Thematically, Stray recapitulates many of the concerns recently raised by Debra Granik’s Leave No Trace. Both are carefully constructed, pared down examples of naturalistic film-making that display a compassionate empathy for those who have made a conscious decision to turn their backs on conventional lifestyles. Like the two main characters in Stray, Granik focusses her camera on people who lead an elemental existence, pursuing a Thoreau-style existence under leaking tarps, making fire from the earth, gathering water from the sky, and conducting military-style drills for staying undercover. Grizzled army veteran Will is unconcerned with what the future may hold, nor whether his thirteen year-old daughter Tom should move into a tent of her own, let alone interact with other teenagers. The subdued humility of their chosen lifestyle eschews scenery-chewing, emotional fireworks, and adolescent histrionics. Just as Granik’s film opens and closes with images of spider webs glistening amid the forest sunlight that imply a dual sense of both freedom and entrapment, Feneley employs the natural landscape as an opportunity for reflection and personal self-examination. He shares not only Granik’s disconcerting ability to discover a degree of tenderness amid desperate lives lived on the margins of society, but also Werner Herzog’s instinctive feel for placing figures in a pristinely beautiful, but somehow impervious environment. The movement of Feneley’s film, however, is from institutional confinement to the open expanse of the South Island’s immensely picturesque mountains and lakes. This is an essentially Romantic conception of Nature reflecting interior states of consciousness – the stark and frozen environment mirroring the spiritual and emotional isolation of its inhabitants. Kieran Charnock’s Jack is a taciturn young man on parole after serving time for attempting to murder the man who killed his girlfriend in a hit-and-run accident. Laid off from his metalworking job, he retreats to a hut located somewhere near Alexandria. He is conflicted between trying to atone for his past and seeking revenge, and his tortured and lacerated hesitation implies that he remains much closer to the scene of the crime than he might care to admit. Locked up in an emotional prison of his own design, one cold evening he encounters the aptly named Grace breaking into his hut. Like Will in Leave No Trace, Grace is off her meds, deracinated, and in search of safe refuge, nor is she above a bit of petty larceny herself. Their private demons lurk just below the surface as they drift into a perversely doomed relationship that possesses the paradoxical potential to both hurt and heal them. Feneley’s measured pacing creating a tense, hypnotic spell, broken only by the momentary mutual attraction between these these two traumatised and enigmatic strangers, struggling to survive in a society that ostracises its most deeply damaged denizens. The movie’s banal dialogue suggests deep levels of fear, repression, and denial with a minimalist linguistic economy that is heavily freighted with negative affect, underscoring Jack and Grace’s fundamental inability to articulate their feelings. This heartbreaking sense of separation is expressed not through explanatory exposition, but by means of understated looks, gestures, and body language. Charnock plays Jack the lag with wounded vulnerability, while Arta Dobroshi’s equally muted performance as the older woman with a troubled past is as striking as Kiwi Thomasin McKenzie’s characterisation in Leave No Trace. Ari Wegner’s luminous cinematography captures the rugged Alpine terrain in a series of gorgeously framed and mostly immobile long shots. The absence of cross-cutting, close-ups, and point-of-view shots allows editor Dione Chard to simply select whichever extended, self-contained take resonates the most fully. Feneley’s directorial preference is clearly to dwell on the minatory and majestic mountain scenery, which is depicted with chilling and crystalline clarity. For once, Graeme Tuckett hit the nail on the head when he commented that “a short sequence set in a small-town bingo game would sit happily within a Roy Andersson or Aki Kaurismaki film … Stray is film-making as Haiku, telling us just enough to hint at something wondrous and near-universal, but asking us to make our own leaps where the connective tissue might be.” With its ambiguous title that can function as both noun and verb, and abrupt, unresolved ending, this is (in the words of Tom Augustine) “an iceberg of a film – what appears above the surface barely scratches at the behemoth of emotion lurking within.” Like Granik before him, Feneley has created an absorbing, low-key drama about social alienation that is by turns tedious, morose, and melancholy – just like real life, in fact. The result is a film wrapped within an aura of authenticity and raw realism that should be seen on the big screen to be fully appreciated.